RTGRAM is a free program for displaying a real-time scrolling spectrographic display of an audio signal. With RTGRAM you can monitor the spectro-temporal characteristics of sounds being played into the computer's microphone or line input ports. RTGRAM is optimised for speech signals and has options for different sampling rates, analysis bandwidths, temporal resolution and colour maps. - Specify maximum display frequency rather than sample rate to allow zooming into low frequency region of signal. Download the file called rtgram1dd.exe into a temporary directory. Then find and run the file to unpack and install. A spectrogram is a display of the frequency content of a signal drawn so that the energy content in each frequency region and time is displayed on a coloured scale. The horizontal axis of the spectrogram is time, and the picture shows how the signal develops and changes over time. The vertical axis of the spectrogram is frequency and it provides an analysis of the signal into different frequency regions. You can think of each of these regions as comprising a particular kind of building block of the signal. If a building block is present in the signal at a particular time then a highlighted region will be shown at the frequency of the building block and the time of the event. Thus a spectrogram shows which and how much of each building block is present at each time in the signal. The building blocks are, in fact, nothing more than sinusoidal waveforms (pure tones) occuring with particular repetition frequencies. Thus the spectrogram of a pure tone at 1000Hz will consist of a horizontal line at 1000Hz on the frequency axis. Such a signal only contains a single type of building block: a sinusoidal signal at 1000Hz. Wideband spectrograms use coarse-grained regions on the frequency axis. 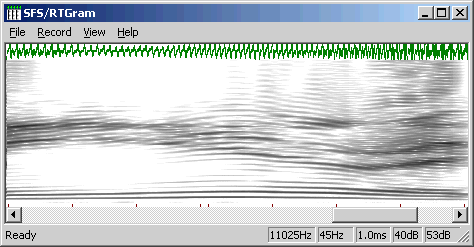 This has two useful effects: firstly it means that the temporal aspects of the signal can be made clear - we can see the individual larynx closures as vertical striations on a wide band spectrogram; secondly it means that the effect of the vocal tract resonances (called formants) can be seen clearly as black bars between the striations - the resonances carry on vibrating even after the larynx pulse has passed though the vocal tract. The bandwidth for the wideband display is fixed at 300Hz. Narrowband spectrograms use fine-grained regions on the frequency axis. This has two main effects: firstly fine temporal detail is lost which means that the individual larynx pulses are no longer seen; secondly fine frequency structure is brought out consisting of the harmonics of the larynx vibration as filtered by the resonances of the vocal tract. This kind of display is most useful for the study of slowly varying properties of the signal, such as fundamental frequency. The bandwidth for the narrowband display is fixed at 45Hz. Use the Spacebar to toggle recording on and off. Use the left and right arrow keys to scroll the display left and right (when paused). Keyboard shortcuts: [C] - Configuration, [G] - Grid, [P] - Replay, [R] - Refresh. As well as monitoring an input microphone or line-level signal, you can monitor the computer's own audio output signal using options in the Windows mixer control. Select Record/Mixer and then Options/Properties to find and select the "Wave Out" channel control. The grid marks are 1000Hz and 100ms apart. If you find the study of speech interesting, why not visit the Internet Institute of Speech and Hearing at www.speechandhearing.net ? There you will find tutorials, laboratory experiments, reference material, and details of e-mail lists and discussion groups. RTGRAM is not public domain software, its intellectual property is owned by Mark Huckvale, University College London. However RTGRAM may be used and copied without charge as long as the program remains unmodified and continue to carry its copyright notice. Please contact the author for other licensing arrangements. RTGRAM carries no warranty of any kind, you use it at your own risk. 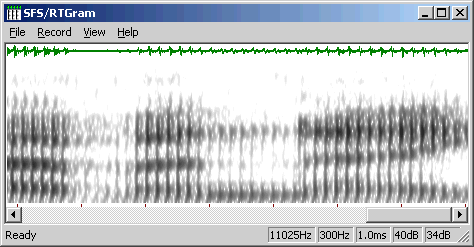 RTGRAM is a free program for displaying a real-time scrolling speech spectrogram on Windows computers. More information. RTSPECT is a free program for displaying a real-time waveform and spectrum display of an audio signal on Windows computers. More information.